Home » How Can I Get My Heat Back? A few times each month, we post a blog to keep our customers informed. While we occasionally bring you “breaking news”—like adding secure automatic payment options to our website or adding Autogas-powered vehicles to our fleet—we also believe that some things are worth repeating, especially when it involves your comfort and safety. With that in mind, here is a reminder of what you can do if you wake up one morning and you discover that your heat has stopped working. Check the fuel level in your tank. Be sure all system power switches are in their “on” positions. Check fuses or circuit breakers. 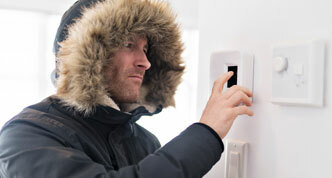 Make sure your thermostat is set above room temperature and to HEAT. Check the batteries also. Press the reset button on the oil burner ONCE ONLY. Pushing it more than once could flood your system with oil, resulting in a costly repair. If the burner starts but stops again after a few minutes, you should call us for service. Many of these tips are similar, but there are a few differences. First, you should check your fuses/circuit breakers and make sure the thermostat is properly set. If you have a propane furnace or boiler, check the fuel level in your tank. It should never fall below 10%. There is also a reset button on gas furnaces that pops up when there is a problem; the button is designed to restart the blower motor if necessary. Your furnace may have shut down because the motor overheated or the electric supply got interrupted. If that happens, a switch in the furnace will “trip,” usually before the circuit breaker does. The reset button will then pop up. One more tip for some gas systems: you should also see if the pilot light is still lit. Note: Most heating systems now have electronic ignition systems, which are more reliable than traditional pilot lights. When an electronic ignition switch fails, the heating system will not ignite. Dust and dirt in the area, along with dirty air filters, can also cause the switch to fail. Faulty control boards and faulty safety switches are also responsible for the failure to ignite. This is why getting your heating system checked and serviced on a regular basis is so important. Whether you have an oil or gas system, if, after all these steps, you still have no heat, call us, don’t email. 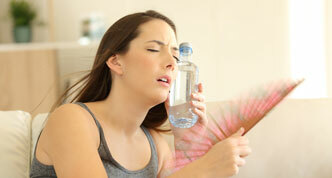 Once we have determined that a service call is required, we will get someone to your home as soon as possible. Our goal is to keep our customers warm and comfortable all winter long, whether outdoor temperatures are “normal” or in the single digits. If you have a sudden breakdown, our customers can rely on our 24/7 emergency services from “the people you can trust” at Wilson Oil and Propane. Tip: Bookmark our Troubleshooting Guide for easy reference.